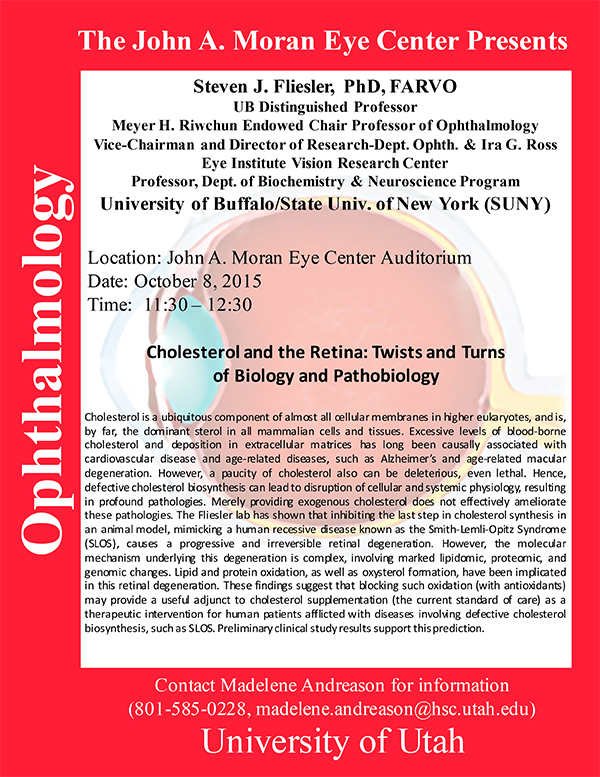 Steven J. Fliesler, UB Distinguished Professor and Chair of Ophthalmology at University of Buffalo/State University of New York (SUNY) will be delivering a seminar on Cholesterol and the Retina: Twists and Turns of Biology and Pathobiology on Thursday, October 8th at 11:30am in the the Moran Eye Center auditorium. Abstract: Cholesterol is a ubiquitous component of almost all cellular membranes in higher eukaryotes, and is, by far, the dominant sterol in all mammalian cells and tissues. Excessive levels of blood-borne cholesterol and deposition in extracellular matrices has long been causally associated with cardiovascular disease and age-related diseases, such as Alzheimer’s and age-related macular degeneration. However, a paucity of cholesterol also can be deleterious, even lethal. Hence, defective cholesterol biosynthesis can lead to disruption of cellular and systemic physiology, resulting in profound pathologies. Merely providing exogenous cholesterol does not effectively ameliorate these pathologies. The Fliesler lab has shown that inhibiting the last step in cholesterol synthesis in an animal model, mimicking a human recessive disease known as the Smith-Lemli-Opitz Syndrome (SLOS), causes a progressive and irreversible retinal degeneration. However, the molecular mechanism underlying this degeneration is complex, involving marked lipidomic, proteomic, and genomic changes. Lipid and protein oxidation, as well as oxysterol formation, have been implicated in this retinal degeneration. These findings suggest that blocking such oxidation (with antioxidants) may provide a useful adjunct to cholesterol supplementation (the current standard of care) as a therapeutic intervention for human patients afflicted with diseases involving defective cholesterol biosynthesis, such as SLOS. Preliminary clinical study results support this prediction.